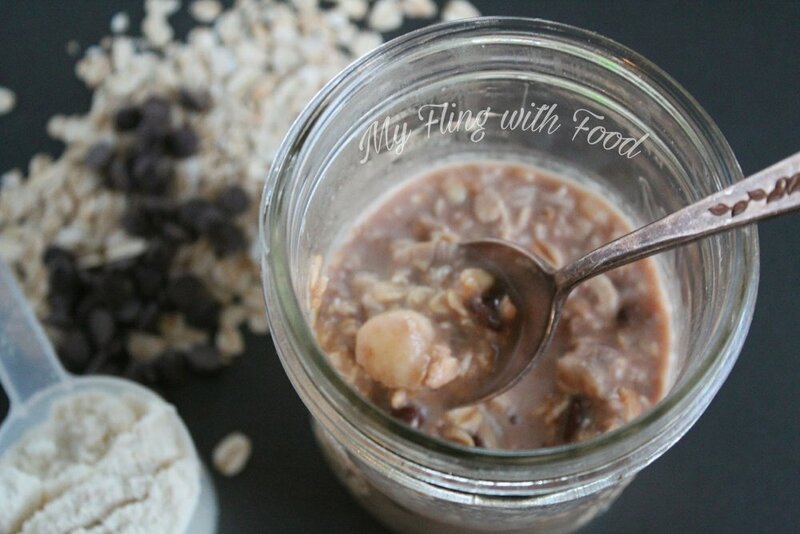 I am so excited to share these overnight oats recipes with you! They're a fantastic (and EASY) make-ahead E breakfast. It's perfect for those rushed mornings on-the-go. Chunky Monkey is my favorite ice cream flavor combination of all time. If you're unfamiliar with it, it's banana ice cream with dark chocolate chunks and walnut pieces. Can't really have the walnut pieces with this, unless you want to make it a crossover, but with the help of Lily's chocolate chips I can have the chocolate-banana combo. [Side note: I will make a low carb chunky monkey ice cream one day - count on it.] A serving size of Lily's chocolate chips is about 60 chips, which I figured out (through counting tiny chips) is roughly 2 Tablespoons (and has only 4.5g of fat at the full serving, perfect for an E). I only used one Tablespoon in this recipe, and it was plenty chocolatey. These oats took me just 5 minutes to prep (and I prepped 4 at once! ), and they use simple ingredients - nothing crazy here. The only prep involved is to place all of the ingredients into a wide mouth mason jar, or something similar, and stir until combined. I like the wide mouth jars for this, because it's easier to get down into the jar with a small spatula to stir everything together. Of course, the jars all come with their own lids making storage a breeze. The oats have to be in the fridge for at least an hour, but you can prep a few days worth at a time, up to about 5 days. Place the oats into the jar, then follow with vanilla, salt, whey protein isolate, unsweetened vanilla almond milk, Pyure or THM Gentle Sweet, mashed banana, and Lily's chocolate chips. Stir to combine, then set in the fridge for at least one hour. Then in the morning, you have these perfectly softened, creamy oats with chunks of banana and rich chocolate chips. These oats, coupled with a big cup of collagen green tea, were the perfect light, yet filling breakfast before heading off to the gym.